Explanation: Celebrate the New Year with the Fireworks Galaxy! Also known as NGC 6946, the big, beautiful spiral galaxy is located just 10 million light-years away, behind a veil of foreground dust and stars in the high and far-off constellation of Cepheus. From our vantage point in the Milky Way Galaxy, we see NGC 6946 face-on. In this colorful cosmic portrait, the galaxy's colors change from the yellowish light of old stars in the core to young blue star clusters and reddish star forming regions along the loose, fragmented spiral arms. NGC 6946 is bright in infrared light and rich in gas and dust, exhibiting a furious rate of star formation. 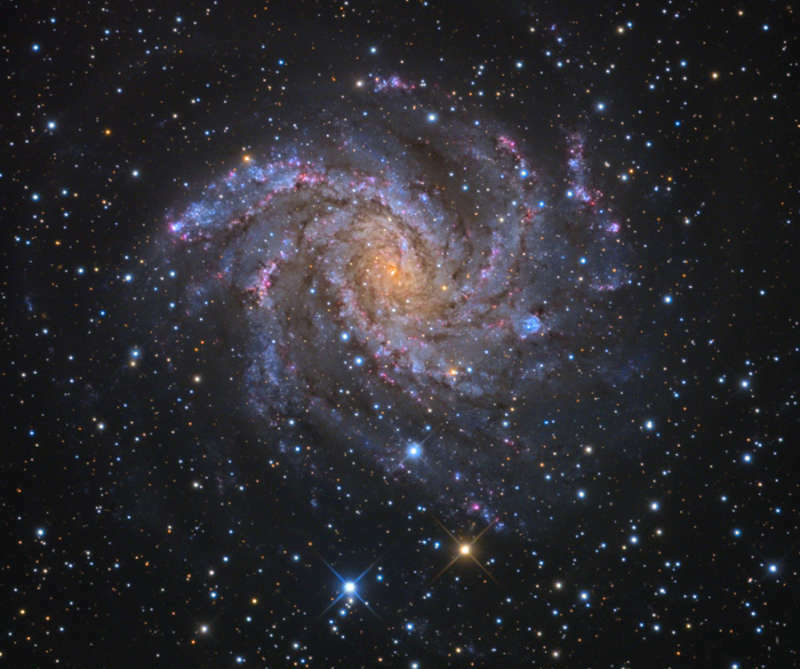 Nearly 40,000 light-years across, the nearby spiral is fittingly referred to as the Fireworks Galaxy. Over the last 100 years, at least nine supernovae, the death explosions of massive stars, were discovered in NGC 6946. By comparison, the average rate for supernovae in the Milky Way is about 1 per century.